But pain is pain and inflammation regardless of the cause results in pain. The body does not differentiate between what kind of inflammation when it comes to pain. Pain is pain. And we can find relief with an anti-inflammatory diet. Yes, maybe in the case of an overuse issue, the inflammation can go down once you stop the activity. But the question is always, how bad do you want the pain to go away and how soon? For me, with my impeding hip surgery only 5 days away, I have been on a hyper anti-inflammatory diet using only foods to lower my inflammation for the past 10 days. Yes I do have the extra drive to get it done, as I have no option to take anything that will kill the pain. No supplements, no NSAIDs, no meds. Just Tyelonol which does nothing for me. So why not experiment with a hyper plan to get relief from the pain? Some of you may be asking: ‘Why do YOU need a detox plan?” And I really don’t need one. I eat a modified detox plan all the time. But I started the group 2 Week Detox Plan to coincide with my pre-surgery preparations. 2 weeks before surgery, I had to stop taking my anti-inflammatory supplement, I had to stop taking my fish oils, and I had to stop taking Advil or any NSAIDS for that matter. Not that I was taking that much Advil, but I wanted to see if diet can lower inflammation and pain. I wanted to add the hyper anti-inflammatory twist to relieve the pain naturally. And I have to say, it does work and I have no pain. I have discomfort though as I can feel every bit of that bone rubbing on the bone in my hip. Ouch. But I keep swimming every 3 days, and I bike the stationary bike all the other days. I do some yoga before I go to bed, but this past week I refrained from doing a longer session as that usually aggravates the hip. And I cannot take anything for the pain. So I have limited the exertion to avoid pain, and I have avoided inflammatory foods for the same reason. I want to be without pain. Pain is pain, and we are grumpy when we are in pain. This is what my left hip looked like 4 months ago. 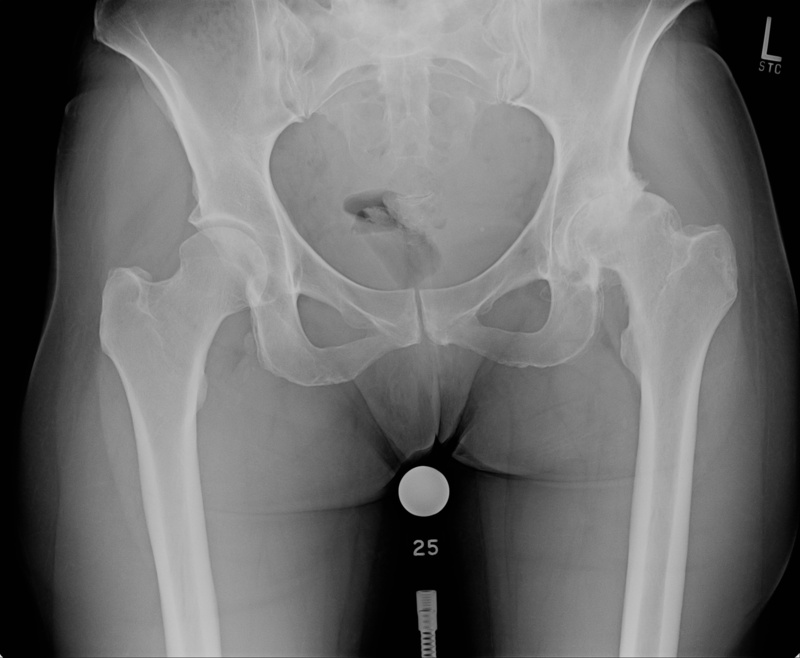 The left hip is the one on the right – I was lying on my back when they took this hence L on right corner. As you can see, there is no space between the joint. Now there is even less. The answer is yes, you can alleviate the pain with anti-inflammatory foods and rest, but to keep the inflammation away, it requires that some modified anti-inflammatory diet be continued for life. After you relieve the pain, you can start to test foods one at a time in small quantities to see if the pain returns. Usually you will know within 4-12 hours whether a food is inflammatory or not. My hip was a great barometer for pain. If I ate brown rice, I had pain and stiffness within 4 hours which did not subside unless I took 1-2 Advil and did yoga before bed. In as much pain as I was in with that, I had to force the yoga stretches for some relief. If I eat sugar, I get the same reaction. Pain is pain, so for me, if I incur pain, I can now easily stay away from the food. But and Anti-inflammtory diet is not always enough. Nutrition Response Testing identified sugar, wheat and brown rice to be my food items, but I also know dairy, cow milk products, will cause inflammation. I also had petroleum based products identified with Nutrition Response Testing. No, I never eat it, but it was in my lip balm, and I was using Aquaphor as a medicated lubricant. When I eliminated all those items, the pain diminished drastically. But I was also taking my anti-inflammatory supplements and fish oils. Now, I am not allowed to take those before surgery, so I am resorting to none of those items during this time. As the days marched on, I kept up with my hyper anti-inflammatory diet, and now a day before surgery, and I did not have a cranky hip and stiffness this morning even though the temperatures plummeted last night. That was not the case 2 weeks ago. 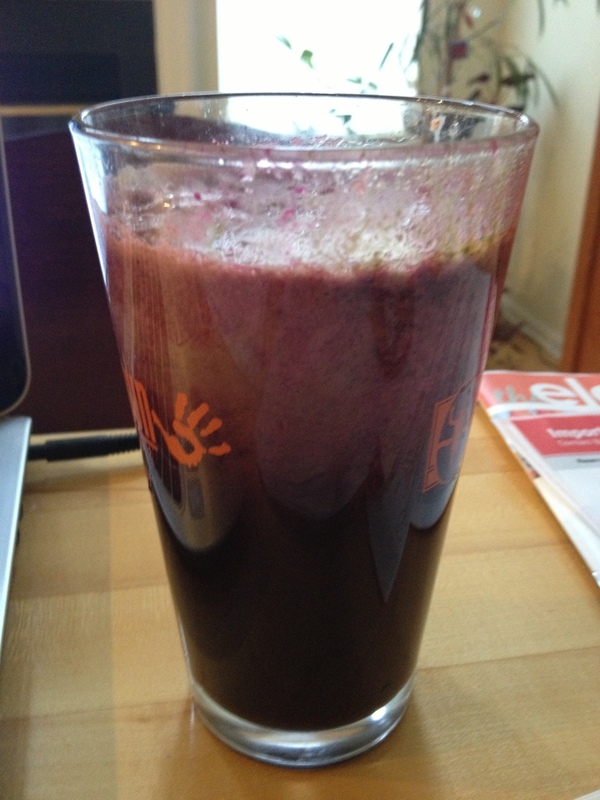 My addition of turmeric root, cabbage, parsley, extra ginger, and daikon radish to my morning juicing really did help. 2 weeks ago, I noticed the pain melt away within 30-40 minutes of drinking my morning juice. As they days went by, I noticed each day I had less pain. I took half the pain meds at night, then none. And now it has been a week without taking anything at night or during the day. In my bone-on-bone condition, I think that is basically unheard of. But honestly, no pain is no pain. What else is in that juice? I think I posted that before but here is what I now have in my morning vegetable juicing cocktail to relieve my inflammation. Every morning I make this and the pain goes away. And now, I make it to keep it away! Pain is pain, and I can attest to the fact that changing your food intake cane eliminate the pain. I now know you can do it as I have done it. It does take some work, but it allows for a pain-free existence without spending money on medications. Why fund the drug companies, when you can use real food to alleviate the pain? If you are interested in learning more about the anti-inflammatory diet to help you be pain-free, please visit Joanna at www.n-im.net. It can help those prior to surgery, those who have inflammatory conditions including arthritis, fibromyalgia, lupus or poor recovery from excessive exercising/training. This has got to be the fastest way to understand how to stop your pain and inflammation, once and for all. Call 800.211.4808 for a very short, yet powerful recorded message.